After seven long years of economic malaise, it is clear that something has gone awry in Japan. Unless Japan undertakes sweeping reform, official forecasts now warn, growth will steadily dwindle. How could the world's most acclaimed economic miracle have stumbled so badly? 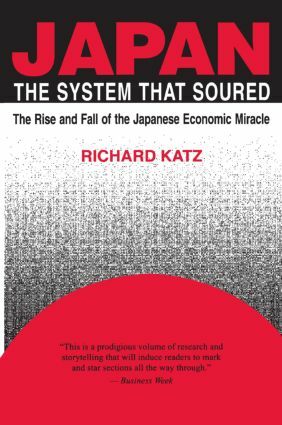 As this important book explains, the root of the problem is that Japan is still mired in the structures, policies, and mental habits of the 1950s-1960s. Four decades ago while in the "catch-up" phase of its economic evolution, policies that gave rise to "Japan, Inc". made a lot of sense. By the 1970s and 1980s, when Japan had become a more mature economy, "catch-up economics" had become passe, even counterproductive. Even worse, in response to the oil shocks, Japan increasingly used its industrial policy tools. not to promote "winners", but to shield "losers" from competition at home and abroad. Japan's well-known aversion to imports is part and parcel of this politically understandable, but economically self-defeating, pattern. The end result is a deformed "dual economy" unique in the industrial world. Now this "dualism" is sapping the strength of the entire economy. The protection of the weak is driving Japan's most inefficient companies to invest offshore instead of at home. Without sweeping reform, real recovery will prove elusive. The challenging thesis articulated in this book is receiving widespread media attention in the United States and Japan and is sure to provoke continuing debate and controversy.